July 15 is Jocelyn Bell Burnell’s birthday. Bell is an Irish astronomer who discovered the first four pulsars. A pulsar is a rotating neutron star that generates a beam of electromagnetic radiation from the star’s magnetic poles. As the star rotates, the beam creates a lighthouse effect giving a ‘pulse’ of light. Pulsars get their name from the contraction of ‘pulse’ and ‘star’. One amazing aspect have very short rotation periods ranging from milliseconds to seconds. and emit radiation in visible, x-ray, radio and gamma ray spectrums. 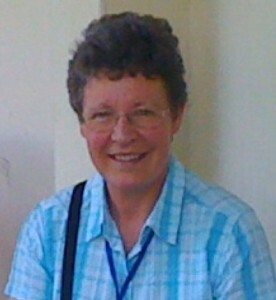 Jocelyn Bell was a doctoral graduate student at Cambridge under the supervision of Anthony Hewish in 1966. She spent a summer assisting in the construction of a radio telescope that covered 4 1/2 acres of the English countryside. The telescope was constructed to help detect and identify a recently discovered phenomenon called quasars. Quasars are were discovered in the early 1960s as sources of radio noise, but had no visible source. Anyone interested in radio astronomy was tuning their equipment to investigate quasars. One of Bell’s duties was to operate the new telescope and analyze the data it collected. The telescope’s signal was recorded on a rolling track recorder that generated nearly 100 feet of paper per day. Her job, check the paper for peaks indicating a radio source. When she found a peak, she had to distinguish it from noise, interference or a genuine source. She eventually noticed a small section of the chart that wasn’t quite a peak, but wasn’t interference either. Further study showed it was a signal that repeated every 3.66 seconds. The first reaction was that the signal was too regular to not be man made. After eliminating these sources of interference, the signal had to come from space. Because of their regular pattern, the idea that maybe it was a signal from an extraterrestrial civilization became a sort of joke among the team. They even labeled the signal LGM-1 or Little Green Men – 1. Four different radio sources were discovered that would be determined to be a form of neutron star that would eventually be called a pulsar. After news of the discovery appeared in Nature, the media became interested in the story. Once they found out a woman was involved, they got even more coverage. Jocelyn became a celebrity almost overnight. She would go on to earn a lot of recognition for her work in astronomy and for her efforts to improve the status and number of female scientists. One award she did not share in was the 1974 Nobel Prize in Physics for the discovery of pulsars. This award went to her advisor, Anthony Hewish. Some people have expressed the opinion the Nobel committee made a grave error in this omission, but not Bell. She said the supervisor is ultimately responsible for the success or failure of events and discoveries in their laboratories. She also believed Nobel Prizes should not be awarded to everyone that helped as that would diminish the honor. Happy Birthday Jocelyn Bell Burnell!